"The Predator" is now in theaters, actor Boyd Holbrook was honored to be part of the film and found that working with director Shane Black to be a different experience. Although Holbrook said he enjoys doing action films, he really gets going when he is able to do character work and dive into a role with niche unique stories. Being part of a cast that continues a fan favorite franchise like that of the Predator franchise brought Holbrook a great opportunity to live a dream of his. Holbrook said the character of McKenna gave him an opportunity to play a Harrison Ford or Clint Eastwood type character, which he has been a fan of. McKenna is a character which starts off as a lone wolf and gets thrown into a dysfunctional group of heroes that are the underdogs, which when put up against the predators any human warrior would be an underdog. With the unpredictability of director Shane Black, Holbrook said it was a fun experience to be part of the amazing group of heroes, nicknamed The Loonies, of "The Predator." The Loonies was a strange group of soldiers that are under psychological treatment which brought comical moments. Holbrook said that it was hard to keep a straight face with this group because they were all very funny and it was fun to be around the group while on set. The group quickly go from being strangers who happen to be put together on a bus as they are being transported to a group of soldiers who are on a mission and Holbrook said that they all collaborated well and they were all very well cast. The film had scenes, such as McKenna's return home, which were highly improvised and written on the spot keeping the film being a cooperative process. 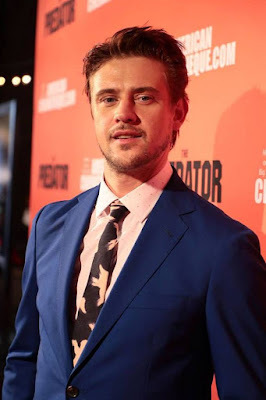 Holbrook said that if there is a sequel he would enjoy coming back and being the main warrior again, which with the ending of "The Predator" the audience knows exactly in what role he would want his character to take.